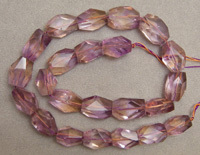 The strands of faceted nuggets below have all been sold. 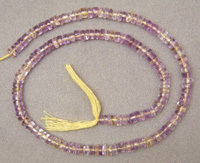 Each of the beads on these strands shows the purple and gold colors of true ametrine. This is some of the nicest ametrine we found last year. Look for more strands like this in 2013, hopefully by February. 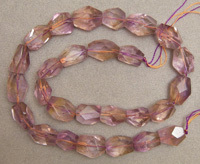 Smaller ametrine faceted oval beads, small wheel beads and some rondelles. The beads below are faceted in a step cut. 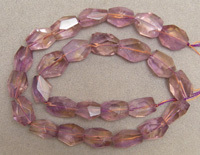 The raw was mined in Brazil and the faceted ametrine nugget beads were cut in Jaipur, India. 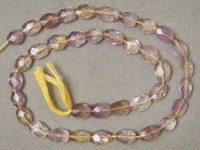 These strands are graduated ending with large nugget beads. You're not likely to find nuggets of this size and quality elsewhere for these prices. 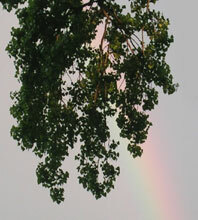 The above strands are gone but we have more of the same type below. We have small groups this time so they are more affordable. 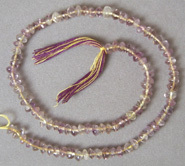 These beads are true ametrine and have beautiful changes in hue in different lighting. Both colors of the ametrine appear in ordinary (darker) room light.